For our babymoon, my husband and I stayed at the El Conquistador Resort in Fajardo, Puerto Rico. 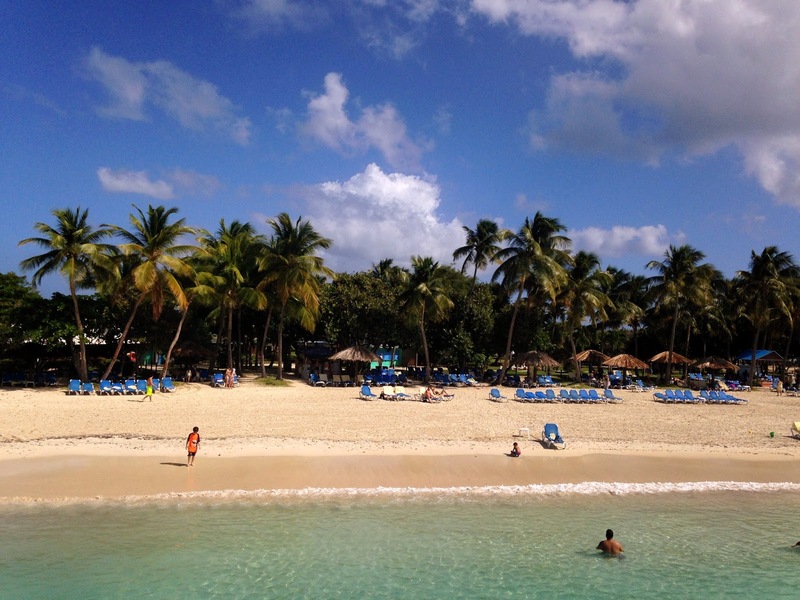 Fajardo is about a 45 minute drive east of San Juan, where you will most likely fly in to. An El Con Resort shuttle will pick you up and take you back to the airport (with a reservation and for an additional fee). We planned our trip close to Thanksgiving because the timing made most sense with our schedules, flights and rooms were reasonably priced during this time, and because it would definitely be warm there and not snowing like it did in DC while we were gone. One thing that made me nervous leading up to our departure was that the weather forecasted rain for every day of our trip in PR. However, that was definitely not the case when we arrived. It was 80+ degrees and sunny for 6 out of the 7 days. On only one morning did it rain for a few minutes but then cleared up for the rest of the day. It did rain in other parts of Fajardo (i.e the rainforest nearby) but not at the resort. Before I get in to what we did while we were there, I have to talk about the two general types of vacations I like to take. The majority are of the touristy\sighting seeing kind, where I have an itinerary planned out for each day of the trip with walking or public transportation routes and times and restaurants mapped out. I love these types of vacations because I love to explore and plan, but it wasn't the type of vacation we wanted for our babymoon. We wanted to relax, read, and have a lot of quiet time to talk and connect. The only other time we've taken this type of vacation was on our honeymoon. We loved it and felt really refreshed afterwards. The main perk of staying at a resort is that they provide almost everything you may need on-site so that you don't have to leave if you don't want to. The con is that things aren't cheap. They're affordable but add up quickly. You just have to go in with that in mind. Here are some things my husband and I did while in PR. I've indicated which items were included in the resort cost and which were not. Also, don't be surprised if you're charged an additional resort fee per day. Stay in the La Marina Village \\ I booked our flight and hotel package through Expedia as a "King Bed with a Garden View" and honestly, didn't really know what that meant or where that would put our room. It sounded fine? We ended up in the La Marina Village in a top floor room (looked just like this) with a private balcony that overlooked the marina. We were steps away from the ferry that takes you to Palomino Island, El Con's 'private' island. Included with Wi-Fi. Drink several pina coladas on Palomino Island \\ We spent every other day on Palomino Island. The are two ferries that transport guests to and from the island, and one will be at the island or the marina every 30 minutes. I previously put private in quotes because there are several local boats that will dock on one side of the island and have BBQ parties on the shore. I didn't mind this at all. It was actually very fun to see. If it was a different trip and my Spanish was better, I may have asked to join them, but I digress... The pina coladas in PR are THE BEST I've ever had, even without rum. Their tastiness made complete sense when I found out the drink was invented in PR. There's also a restaurant on the island called, Iguana Cafe. Though you don't actually have to go to the restaurant. You can order pina coladas and cafe food from waiters who walk around the island. Ferry transfer and access to island included. Pina Coladas, food, and tips not included. 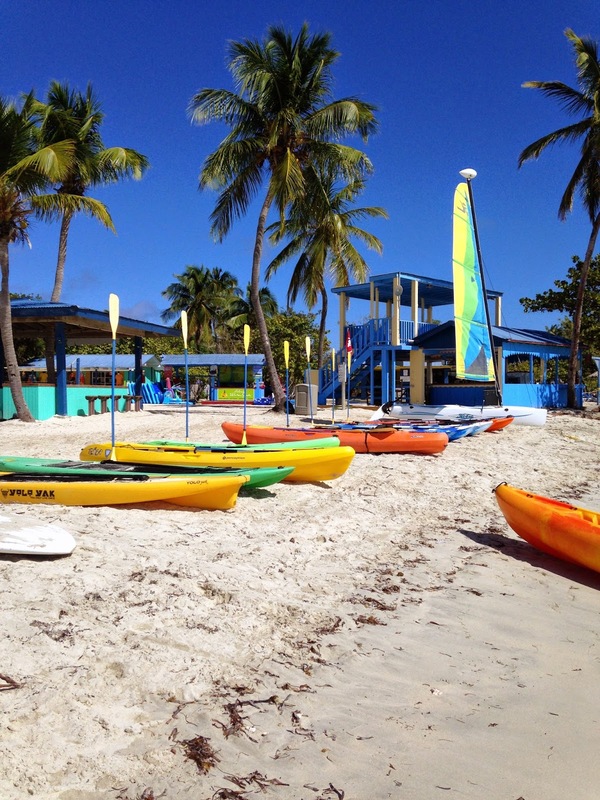 Rent an umbrella on Palomino Island \\ There are several beach chairs available for no extra fee. They're first come first serve, and you can move them around however you like. Aside from the occasional walk down the shore and dip in the sea with my husband, I embodied my inner old, asian lady who wears a huge hat, big sunglasses, SPF 50, bug spray, and sits under the umbrella with her book 75% of the time. Towels are also provided. I would always get three - one to lay on the chair, one for my lower back, and one for my bump for laying on my side. Towels included. Umbrellas not included. Go on a hike on Palomino Island \\ I did not do this but my husband did. I was completely content doing what I mentioned above. Here's what he said about the hike: "It took me about 45 minutes to casually hike from the bottom to the top of the mountain and back. Along the way, I saw two iguanas, lots of birds, and lots of horse poop. It was pretty hot so I should have brought water and shoes that weren't flip flops. I saw a 'private cove', visited a chapel, and walked up to a lookout point where I could see for miles." Included. Go to every pool \\ On days we weren't at Palomino Island, we were at one of the three pools available to us. We even went for a quick swim in a pool after we got back from Palomino Island. There are also several jacuzzi for those of you who are not pregnant. Like Palomino, towels are included and waiters come to you for food and drink orders. Unlike the Palomino, you don't have to pay extra for an umbrella, you just need to find an open chair next to one. There are also cabanas with TVs available to rent, but I didn't do this. Between relaxing at the beach and the pools, I read two books on my trip! Pool access and towels included. Eat at Ballyhoo Bar & Grill \\ We probably ate at Ballyhoo the most out of any of the restaurants available. We even got food to-go one night and ate in our room. It was close to our room, so right on the marina where you can watch boats come and go. Sitting out there reminded me of living back in Florida. We enjoyed eating the cuban sandwiches (sans deli ham for me of course) and chicken salad wraps. Food not included. Talk to the 'Hola' bird and keep your eye out for wild iguanas \\ I love animals. So one of the things I got most excited about was seeing wild iguanas roaming around Palomino Island (one day we saw at least five!) and spotting them in trees as we walked to our room. The ones we saw on a daily basis were named Iggy, Azalea, and Iguana Don by me. I'm silly. I realize this. The other animal I got a kick out of visiting was this white bird in the main lobby of the resort. There wasn't a sign with his name on it, but his claim to fame was that he said 'hola'. The first time I noticed him, my husband and I were lucky enough to be the only ones around. He starred deep into my eyes and said 'hola' as he slid down his cage and ate his food. Any other time we passed by him, he was surrounded by people continuously saying 'hola' in hopes that he would join in. I actually heard him throw a fit one day - jumping up and down yelling 'HOLA! HOLA! HOLA!' as though he just wanted people to shut up. My husband and I couldn't stop laughing at this. I wish I had it on video. Included. Rent a car and drive to Old San Juan \\ I could have spent every day on the resort but several friends recommended that we visit Old San Juan. If I had to do it again, I would have planned the OSJ trip right at the beginning or end of the trip. If you want to do this, make sure to coordinate with Enterprise (the rental car company at the resort). They may not accept cars or allow you to return cars to the airport on certain days as was the case when we tried to get one for the last day of our trip. We wandered around OSJ for a few hours, took pictures of all the colorful buildings, and had a snack with pina coladas from Barrachina, one of two locations that claim to be the birthplace of the pina colada. (The other is the Caribe Hilton.) We also stopped by SuperMax, a grocery store in OSJ, for fruit, yogurt, water, beer, a birthday cake, etc. We stored these items in the small fridge that was in our room. Car rental, gas, and tolls are not included. Eat off resort at La Estacion \\ The only major complaint I have about the El Con is that they don't have a Puerto Rican restaurant on-site or even a Puerto Rican section of a menu anywhere (that was apparent to us). I would describe the food available as mostly American. Read more about La Estacion here. I hope this gives you some ideas when planning your babymoon or vacation in Puerto Rico. Let me know if you have any additional questions. For full details on the El Con Resort, see their website. For more pictures of my trip, check out my instagram account with #allbabymoon.